Our interventionist wars in Iraq and Libya have cost us trillions of dollars and thousands of American lives; and al Qaeda, ISIS, and other terrorist organizations are still strong. Today, America is again on a path of interventionism without a plan. Nowhere is this more apparent than in Syria, where we are supporting rebel groups allied with al Qaeda, ISIS and other terrorist organizations. We are spending billions of dollars to overthrow the Syrian government in a war that has led to hundreds of thousands of Syrians being killed or injured and a refugee crisis like we’ve not seen in decades. Our military and intelligence assets are on the ground, yet no one can answer a simple question: What happens if the regime falls? If we succeed in overthrowing the Syrian government of Bashar al-Assad, it will open the door for ISIS, al Qaeda, and other Islamic extremists to take over all of Syria, which will simply increase human suffering in the region, exacerbate the refugee crisis and pose a greater threat to the world. President-elect Trump asked me to meet with him about our current policies regarding Syria, our fight against terrorist groups like al-Qaeda and ISIS, as well as other foreign policy challenges we face. I felt it important to take the opportunity to meet with the President-elect now before the drumbeats of war that neocons have been beating drag us into an escalation of the war to overthrow the Syrian government—a war which has already cost hundreds of thousands of lives and forced millions of refugees to flee their homes in search of safety for themselves and their families. While the rules of political expediency would say I should have refused to meet with President-elect Trump, I never have and never will play politics with American and Syrian lives. Serving the people of Hawaiʻi and our nation is an honor and responsibility that I do not take lightly. Representing the aloha spirit and diversity of the people of Hawaiʻi, I will continue to seek common ground to deliver results that best serve all Americans, as I have tried to do during my time in Congress. Where I disagree with President-elect Trump on issues, I will not hesitate to express that disagreement. However, I believe we can disagree, even strongly, but still come together on issues that matter to the American people and affect their daily lives. We cannot allow continued divisiveness to destroy our country. President-elect Trump and I had a frank and positive conversation in which we discussed a variety of foreign policy issues in depth. I shared with him my grave concerns that escalating the war in Syria by implementing a so-called no fly/safe zone would be disastrous for the Syrian people, our country, and the world. It would lead to more death and suffering, exacerbate the refugee crisis, strengthen ISIS and al-Qaeda, and bring us into a direct conflict with Russia which could result in a nuclear war. We discussed my bill to end our country’s illegal war to overthrow the Syrian government, and the need to focus our precious resources on rebuilding our own country, and on defeating al-Qaeda, ISIS, and other terrorist groups who pose a threat to the American people. Let me be clear, I will never allow partisanship to undermine our national security when the lives of countless people lay in the balance. Hopefully Gabbard does receive an opportunity to work with Donald Trump, and guide him on a less interventionist path. It is hard to see any outcome if Clinton had been elected other than further entrenchment of the warfare/surveillance state and perpetual warfare. While I am not terribly optimistic about Donald Trump handling foreign policy either, at least he has expressed opposition to interventionism at times, leaving open a possibility for a change in course. With all the negative signs so far from Trump, including his right wing appointments to date, his battle with the cast of Hamilton, and a disastrous meeting with members of the news media today, this offers a small glimmer of hope. Posted in Bernie Sanders, Donald Trump, Foreign Policy & National Security, Hillary Clinton, Terrorism. Tags: al Qaeda, Bernie Sanders, Donald Trump, ISIS, Russia, Syria, Tulsi Gabbard. RSS feed for comments on this post.. TrackBack URL. 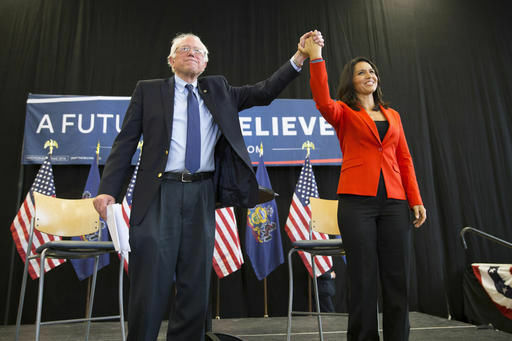 "Gabbard had stepped down as a vice chairwoman of the Democratic National Committee to back Bernie Sanders.."
That would be funny if it wasn't so tragic how rare it is for politicians to act with integrity. Thank goodness for the few who do practice integrity in the political world.